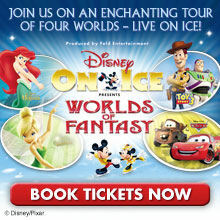 Heading to the home of the International Ice Centre, the Capital FM Arena in Nottingham is Disney on Ice with the 2014 show ‘Worlds of Fantasy’ from the 20th March to 23rd March 2014. Bringing a whole host of Disney and Pixar characters from Cars, The Little Mermaid, Toy Story and many more to life in this ice dancing spectacular. With dazzling effects, stunning outfits and amazing routines it’s thrills and spills all the way. Making it the ideal half term entertainment for all the family, Disney on Ice in Nottingham is now booking.